When not performing, Simon plies his trade as a very successful writer. He is a principal writer for Lee Mack’s sitcom Not Going Out, the panel show 8 Out Of 10 Cats and Armando Lanucci’s Charm Offensive on Radio 4. He has also written jokes for Lee Mack, Dara O’Briain and Sean Lock. It’s almost a surprise that more people don’t talk about Simon as one of the most popular comedians around. The problem is you’ve probably laughed at one of his jokes without knowing it. Seeing Simon perform will make you realise just how good he is. 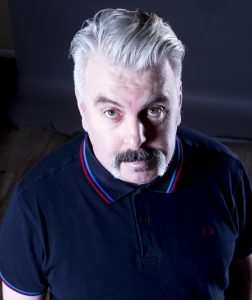 Mick is renowned as a fine purveyor of lugubrious surrealism and has quickly established himself as one of the most sought after comics on the British and International comedy circuit. On our TV screens, Mick has recently starred in BBC One’s Michael McIntyre’s Comedy Roadshow as well as Comedy Blue and The Comedy Store for Comedy Central. He made his big screen debut in 2009 in Ken Loach’s Looking For Eric – a hit feature film at the Cannes film festival where it was nominated for the prestigious Palm D’Or. A prolific writer, Mick was a writer on John Bishop’s Britain for BBC One and has also previously written for BBC3’s Smalltime. Charlie is a one man entertainment machine. He won the Mervyn Stutter Spirit of the Fringe Award in 2009 for his debut solo show and is an in-demand comedian and compere, an actor and a highly acclaimed jazz singer. If Jack Black, Jethro and Frank Sinatra had a son, it would be Charlie. He is unique on the circuit and is rising fast. **Unfortunately, Dave Johns has had to withdraw from the show due to filming commitments. As soon as we know his suitably qualified replacement we will let you know.